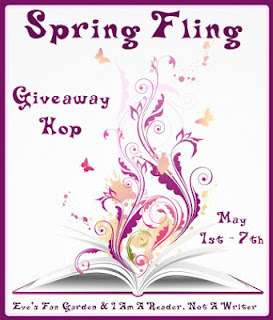 Booking It With Hayley G: Spring Fling Giveaway Hop! Thanks to I Am A Reader, Not A Writer and Eve's Fan Garden for hosting this awesome Giveaway Hop! So let's celebrate Spring with a giveaway! PLEASE READ THE TERMS AND CONDITIONS CAREFULLY! I'm most looking forward to Social Suicide. =) Thanks for the giveaway! I just bought a ton of May releases. So I'd say Golden Lily by Richelle Mead. The paperback editions of some of my fav authors books - 77 Shadow Street by Dean Koontz and Snuff by Terry Pratchett aaand Silent Girl by Tess Gerritsen (to name but a few). I would have to agree with Jen. It's either The Golden Lily by Richelle Mead or Struck by Jennifer Bosworth.Thanks 4 the giveaway! Sweet Evil! Thanks for the awesome giveaway! Insurgent!!! Thanks for the giveaway! I'm really looking forward to This is Not a Test by Courtney Summers, as well as Hemlock and Masque of the Red Death. Thanks for the giveaway! I'm looking forward to read Insurgent. I'm really looking forward to reading Dreamless by Josephine A.
I can't wait for City of Lost Souls by Cassandra Clare! I am looking forward to Masque of the Red Death. Thanks for the giveaway!! I´m looking forward to City of Lost Souls by Cassandra Clare. I'm most looking forward to Blackout by Mira Grant. City of Lost Souls by Cassandra Clare! Thanks for the chance at this great giveaway! Thanks for the giveaway! There are tons of new releases I'm looking forward too, especially Insurgent, Until I Die, and This Is Not a Test. Insurgent is a book EVERYONE in my house wants to read!! BITTERBLUE!! I can't wait for my copy to arrive! My Lady Rival by Ashley March. I love anything Ashley March writes. Embrace Me At Dawn by Shayla Black. The Golden Lily by Richelle Mead :D! Anxiously waiting for The Golden Lily by Richelle Mead. Sweet Evil by Wendy Higgins (already pre-ordered!) and The Golden Lily by Richelle Mead. Grave Mercy looks amazing.I can't wait to read it! Golden Lily by Richelle Mead or I am also looking forward to Once Burned by Jeaniene Frost. Insurgent! And the Last Princess by Galaxy Craze. I can't wait to read Girlchild: A Novel written by Tupelo Hassman, Trapeze by Simon Mawer, or Faith Bass Darling's Last Garage Sale by Lynda Rutledge. I'm most looking forward to Insurgent! Insurgent, everyone's talking about it. I'm looking forward to reading Insurgent. I really want to read Of Poseidon and City of Lost Souls!!! City of Lost Souls and Before I Wake! City of Lost Souls, Sweet Evil and Hemlock! Not to be cliche, but I'm looking forward to Insurgent. Thanks for the giveaway! Thanks for the giveaway! For the last few years I have always looked forward to the spring release of the new Sookie Stackhouse novel and this year is no different. I can't wait to read Deadlocked. It has to be "City of Lost Souls" - I seriously can't wait until it gets released. Thanks! The Immortal Rules and City of Lost Souls! The Golden Lily, The Immortal Rules and City of Lost Souls. Of course that's just a little part of my to-read list and there are so many more books I want! Thanks for the giveaway! city of lost souls and many others. Insurgent. Thanks for the giveaway. Great giveaway! Thanks! I would say The Golden Lily by Richelle Mead or Hemlock, or Endure by Carrie Jones! Once Burned by Jeaniene Frost!! The Book of Blood and Shadow. Thanks for the giveaway! wicked nighr by gena showalter.. The Selection by Kiera Cass. I am looking forward to Insurgent. There are two that I'm eagerly waiting to read. They were both released on May 1st. There are so many fantastic new releases this year!! I can't wait for City of Lost Souls by Cassandra Clare. I'm really looking forward to City of the Lost Souls! I can't wait to read the City of Lost Souls and Golden Lily! I can't wait to read Until I Die by Amy Plum! Thanks for the giveaway! City of lost souls!!! Thanks for the great giveaway!! There isn't really a spring release I'm looking forward to. Sweet Evil I think. Thanks so much for the giveaway! I'd love to read Insurgent. City of Lost Souls!! Sooo looking forward to this one. city of lost souls by cassandra clare! I can't wait for Serpent's Kiss by Melissa de la Cruz. I'd love a copy of The Selection! I'm so excited to read the book, and it is on the top of my TBR list! I'm looking forward to Shadow Bound by Rachel Vincent. Well, I had been looking forward to Deadlocked, it came out on May 1st. I had it and started reading at 1201am! Heh. Definitely Shadow and Bone by Leigh Bardugo! I'd say Revived by Cat Patrick =) . Thanks for the chance!!! Do I really have to pick just 1?? Lol. It would probably be The Immortal Rules. Tangle of Need by Nalini Singh. Silence (The Queen of the Dead) by Michelle Sagara! It's tough to choose, but anything being published by McClelland & Stewart pretty much catches my eye.